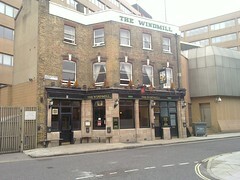 Very much a quiet locals' pub in Lambeth. This pub gives the impression of having been here a while, serving local office workers and residents. Lambeth High Street doesn't really give the impression that its name suggests, and is in fact a rather quiet part of town. Inside, it's all one room, with a range of tables around the brightly-lit space, and a bar to the side. On Ewan's Friday evening visit, there was still space to sit and they were preparing for a pub quiz due to start at 6pm. The clientele were clearly regulars. There are three handpulls for ale, with Adnam's bitter, London Pride, and Greene King IPA (off on Ewan's November 2009 visit). They also have standard draught lagers. There's a TV screen above the room, and music is playing quietly. Last visited by Ewan and friend, 27 November 2009. Last edited 2010-08-22 10:58:01 (version 3; diff). List all versions. Page last edited 2010-08-22 10:58:01 (version 3).